From southern seashores to northern ports, rail transport keeps freight moving and American factories humming. 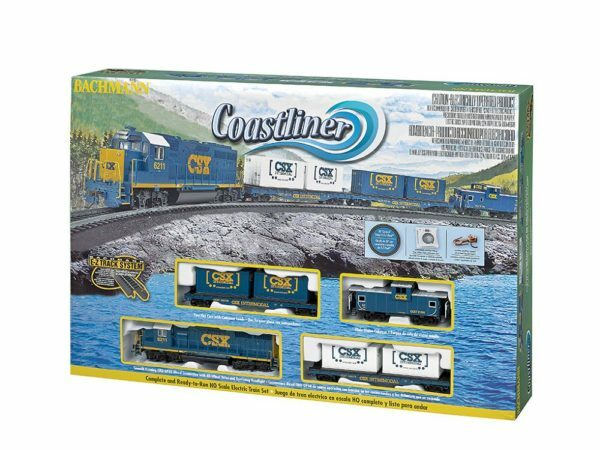 With its distinctive engine and cars displaying the classic CSX® paint schemes, the Coastliner is proud to ride the busy rails of the Eastern seaboard. 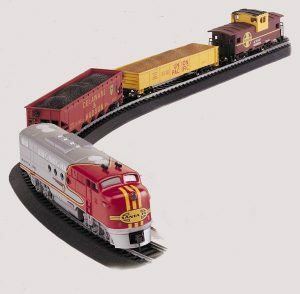 This ready-to-run train set includes: EMD GP40 diesel locomotive with operating headlight and all-wheel drive, two flat cars with container loads, wide-vision caboose, body-mounted E-Z Mate® couplers, 36″ circle of snap-fit E-Z Track®, including 11 pieces curved track and 1 curved plug-in terminal rerailer, power pack and speed controller, illustrated instruction manual.